"The Cheshire Cat (for Kitty)," © 2003, oil on linen, 12x9 in. Not a portrait, but a tribute to the fierce spirit of a beloved pet who had recently passed away. 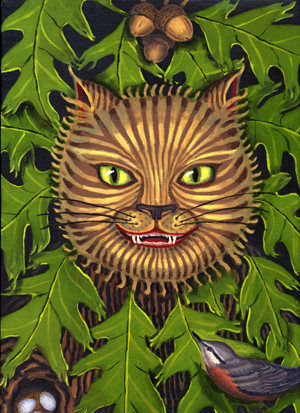 "[S]he was a little startled by seeing the Cheshire Cat sitting on a bough of a tree a few yards off. The Cat only grinned when it saw Alice. It looked goodnatured, she thought: still it had very long claws and a great many teeth, so she felt that it ought to be treated with respect." -- from "Alice's Adventures in Wonderland," by Lewis Carroll.